Launching the James Caird from Elephant Island. Photo: Frank Hurley / Canterbury Museum 19XX.2.268. A logbook from one of history’s greatest boat journeys has helped researchers navigate its success. International researchers had been investigating how the lifeboat James Caird made it across 1500km of sub-Antarctic sea in 1916. The researchers replicated the logbook’s calculations, which helped them understand what an impressive feat navigating the James Caird was. A Canterbury Museum spokesperson said the voyage was undertaken by Sir Ernest Shackleton and his crew after their main ship was crushed by pack ice in October, 1915. The spokesperson said the logbook belonged to James Caird’s navigator, Akaroa-born Frank Worsley, and was part of an internationally significant collection at the museum. One of the researchers Robin Stuart said it was important Mr Worsley got his calculations correct. “Worsley had to take the sights and manually perform the reduction calculations sitting on ballast rocks in a small boat heaving on ocean swells. Yet for that critical 14-day period we did not find a single error. “That he was able to do this in the cold, damp and cramped conditions using rapidly disintegrating navigation books is remarkable indeed. The researchers’ conclusions were published in volume 32 of Records of the Canterbury Museum, the museum’s annual research publication. The voyage of the lifeboat James Caird across 1,500 km of wild sub-Antarctic sea in 1916 is one of history’s greatest boat journeys. An international group of researchers has used the original logbook of the James Caird’s navigator, Akaroa-born Frank Worsley, to work out how this treacherous passage was navigated. Their conclusions are published in Volume 32 of Records of the Canterbury Museum, the Museum’s annual research publication. The logbook is part of an internationally significant collection from the heroic age of Antarctic exploration and discovery that is housed at the Museum. The voyage of the James Caird was born out of desperate circumstances. The Endurance, the main ship of the Imperial Trans-Antarctic Expedition, had been crushed by pack ice in October 1915, leaving its crew – led by Sir Ernest Shackleton – stranded on the ice. After camping on the ice until April 1916, the 28 expedition members eventually reached Elephant Island in the Endurance’s three small lifeboats. With winter closing in and no prospect of being sighted by passing ships, the expedition’s carpenter Harry McNish converted the sturdiest of the lifeboats, the 7 metre-long James Caird, for open sea travel. 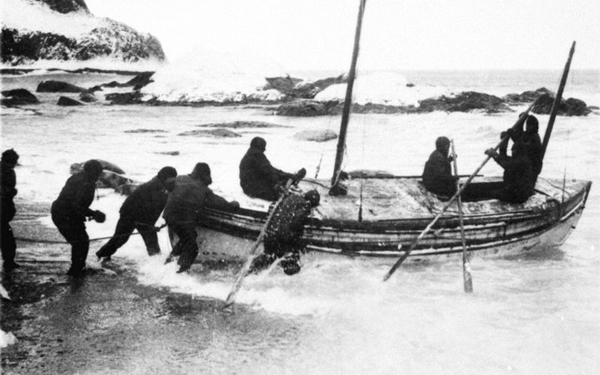 Shackleton, Worsley, McNish and three others set out in the James Caird to seek help from the whaling stations on South Georgia Island. It took them 14 days to cross the 1,500 km of wild seas to South Georgia but they then had to beat off the lee shore in hurricane force winds until it was finally safe to make landfall 2 days later. Worsley’s job as navigator was complicated by the rough conditions. He needed the sun to check the boat’s position, but it appeared only rarely throughout the voyage. Crucially, Worsley also had to estimate the longitude of the group’s starting position on Elephant Island; getting this wrong could have meant overshooting South Georgia to the east with no possibility of backtracking. The research paper gives an introduction to the underlying principles and methods of celestial navigation Worsley used to successfully complete the voyage and provides answers to some key questions such as what source materials and assumptions went into his estimate of the longitude of Elephant Island. The researchers – Lars Bergman (Sweden), the late George Huxtable (United Kingdom), Bradley R Morris (United States) and Robin G Stuart (New Zealand) – were brought together by a common interest in traditional navigation methods. They drew their conclusions through careful study of Worsley’s original logbook. The relevant pages have been transcribed keeping their original layout and all calculations have been independently replicated and annotated. Robin Stuart says replicating Worsley’s calculations drove home what an impressive feat successfully navigating the James Caird was. “Worsley had to take the sights and manually perform the reduction calculations sitting on ballast rocks in a small boat heaving on ocean swells. Yet for that critical 14 day period we did not find a single error. That he was able to do this in the cold, damp and cramped conditions using rapidly disintegrating navigation books is remarkable indeed,” he says. Another paper by Lars Bergman and Robin Stuart, also published in Records Volume 32, looks at the navigation methods used to track the expedition’s location as they drifted on pack ice in the sunless Antarctic winter. This paper includes a transcription and replication of the log entries made during the 6 day passage to Elephant Island. Lars Bergman and Robin Stuart also used Worsley’s logbook to examine the possible location of the wreck of the Endurance, publishing their results in the Journal of Navigation2 in September 2018. Their research was prompted by the news that an international science expedition studying ice shelves in the Weddell Sea, planned to locate and survey the wreck of the Endurance. The 45-day expedition, led by the Scott Polar Research Institute (United Kingdom) which includes scientists from the University of Canterbury, left Penguin Bukta in Antarctica on 1 January 2019 and is scheduled to reach the Larsen C Ice Shelf in 9 days. Publication of the Records of the Canterbury Museum, now in its 111th year, is supported by the Mason Foundation Trust.